Snatcher is a cyberpunk-themed graphic adventure game directed and written by Hideo Kojima and produced by Konami. 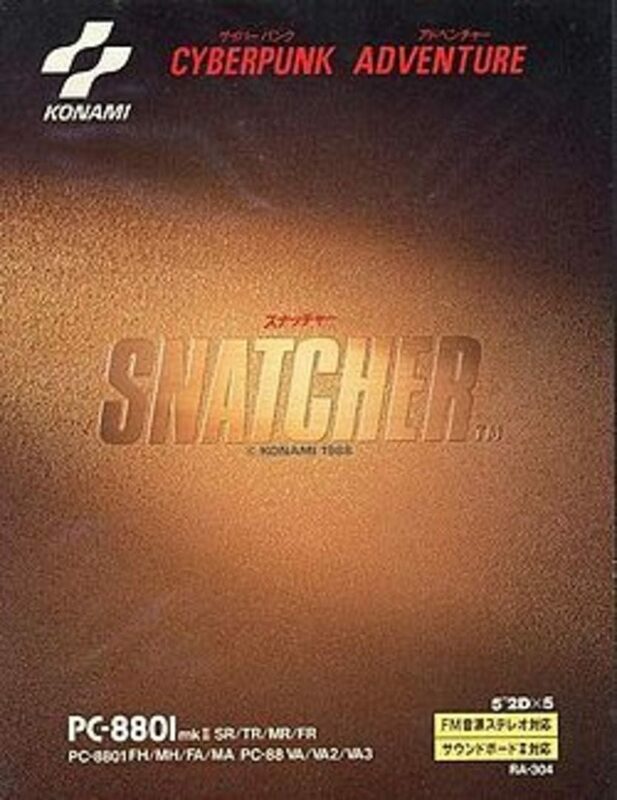 The setting and story of Snatcher is heavily influenced by cyberpunk and science-fiction media, taking place in a large futuristic dystopian city. The story revolves around an investigator named Gillian Seed assigned to investigate a breed of bioroids known as "snatchers", who are killing humans and taking their place in society. The game is set in a primarily first person perspective and uses a menu-based interface that allows the protagonist to interact with his environment. The player can choose to "Look", "Investigate", "Talk", "Ask" and "Move" (in addition to other options) to acquire key items or receive vital information from other characters. The player can analyze items in Gillian's belongings or show it to other characters. During key points of the game's story, the player must pass shooting sequences to defend Gillian from assailants. These shooting segments use a 3x3 grid which the player can target to fire at enemies. A shooting trainer, called "Junker's Eyes", is accessible at Junker HQ that allows the player to measure their accuracy. On June 6, 1996 (1991 in the Japanese versions), a biological weapon known as Lucifer-Alpha under development in Chernoton, Russia, is released into the atmosphere, resulting in the death of 80% of the Eurasian population which in turn results in the death of half of the world's population. The contaminated area becomes uninhabitable for a decade, when Lucifer-Alpha mutates into a non-lethal form. This tragic event later becomes known as "the Catastrophe". Fifty years later, in 2047 (2042 in the Japanese versions), a breed of artificial life-forms or bioroids known as "snatchers" began appearing in the artificial island of Neo Kobe City, killing their victims and taking their place in society. Nobody knows exactly what they are or where they come from. As Gillian Seed, an amnesiac working for an Anti-Snatcher task force called J.U.N.K.E.R., the player's goal is to track down the source of the snatchers and discover Gillian's mysterious connections with them. The story takes place in three acts.